The below artworks are the most important by Martin Kippenberger - that both overview the major creative periods, and highlight the greatest achievements by the artist. Artwork description & Analysis: Kippenberger painted Uno di voi at the very start of his career while living in Florence. It documents his experiences as a foreigner lost in the streets of an unknown city. Uno di voi features a montage of black and white paintings depicting a range of seemingly disconnected subjects - including portraits of a local milkman, a wanted criminal, a stuffed pig, a copy of a Botticelli painting from the Uffizi and a dead pigeon - drawn from souvenir postcards and his own street photography. Kippenberger had originally intended to produce enough paintings to make a stack at a height of the artist himself, but this goal proved impracticable. Artwork description & Analysis: Two men walk arm in arm away from us towards a Dusseldorf bar on a busy day. The taller of the two is Kippenberger, he is gripping a friend's arm for support. Despite their relatively formal attire, both men have a dishevelled look about them, suggestive of a certain fragility. One would be forgiven for thinking that the friends were headed to the bar (in daytime) in order to drown their sorrows. The painting is one of an early career series of twelve for which Kippenberger commissioned a well-known film poster painter - known only as "Mr. Werner" - to paint the image. The images were copied meticulously from Kippenberger's own photographs of ordinary street scenes and he hired a 'technical' painter to render the work for ideological reasons. Kippenberger was influenced by Andy Warhol's factory-like approach to making art whereby employees would assist heavily in art production. He supported the principle that the idea driving the artwork - the concept - was more important than the skill in the artistic execution: "I'm rather like a travelling salesman" he said "I deal in ideas. I am far more to people than someone who paints pictures." Dear Painter, Paint Me, was then a deliberate affront to the dominant trend of German Neo-Expressionism which promoted a style of earnest socio-political enquiry over such frivolous conceptual play. Artwork description & Analysis: In this somewhat graphic self-portrait, Kippenberger is shown beaten, bruised and bandaged. His eyes, nose and upper lip are swollen and covered in yellow bruises. The portrait was made while Kippenberger was manager at the notorious Berlin punk club S.O.36. He had been attacked one night by a gang led by a punk known as "Ratten-Jenny" (earning that prefix on account of the rat she always carried on her shoulder). The gang had felt aggrieved when Kippenberger raised the club's beer prices and had taken a special dislike to Kippenberger's formal, preppy way of dressing. Gallerist Bruno Brunnet added that his attackers were probably more "mad at Martin for having bought his way into SO36" (their club). On arrival at hospital, Kippenberger called up a number of his friends with the aim of documenting his ordeal in photographs. It would be Jutta Henglein who provided him with source material for what would become a trilogy of paintings. Following the attack, Kippenberger was left with a crooked nose and several facial scars. But he seized on the opportunity to create a strong autobiographical statement in a trilogy of photoreal paintings called Berlin by Night (one of which was Dialogue with the Youth Today). As with many of his self-portraits, Kippenberger presents himself as a broken down, fragile figure. Indeed, beneath the witty, ironic title there is a latent sense of personal failure in this painting; an undercurrent which ran through much of his work. Kippenberger was of course unafraid to address the difficult subjects and situations he encountered in his life. It was an attitude that would enamour him to so many of his contemporaries. Artwork description & Analysis: Taking his lead from Pop Art, Kippenberger was interested in the way ordinary objects, once appropriated, could be treated as, or transformed into, works of art. However, Capri by Night fits within the realms of what became known as Neo-Pop Art. Here a Ford Capri car, a "readymade", is parked inside a gallery. It is covered, moreover, in a mixture of orange and brown paint mixed together with oat flakes. The unusual color and texture, not to mention its setting inside a gallery, invites the spectator to consider the Capri as something more - or something other - than a car. As a piece of Pop Art the art work in question need be no more than an emblem of nihilism and consumer culture; or just a joke delivered at the expense of the modern art world. But there is more for the spectator to contemplate here and it was this willingness to challenge Western culture and its values that gives the work added "bite". Kippenberger produced Capri by Night in collaboration with his friend Albert Oehlen in the early 1980s when the two were leading figures on the Cologne art scene. It was in fact one of a series of artworks he made featuring the car. Kippenberger saw the Capri, which was such a popular car in Germany and the rest of Europe in the 1970s and 80s, as symbolic of modern, or every-day, life. And despite its Italian sounding name (named after the Italian island), the car was originally made in America, a state of affairs that Kippenberger found rather ironic. Kippenberger and Oehlen often used their art to parody the work of other artists. This was done not out of spite but in the name of pastiche and 'quotation', both key signifiers of the playful, and often controversial, Neo-Pop tendency. By covering the Capri - such a gleaming symbol of consumer culture - in the paint and oat flakes mixture Kippenberger and Oehlen managed to undermine the socio-political intentions of two of the most important Post-war German artists: Joseph Beuys and Anselm Kiefer. Beuys had mixed his own shade of brown paint, which he named "braunkreuz" (brown cross), as a means of signifying rust, blood and dirt, while the rough, oatmeal texture referenced Kiefer's tactile symbolic paintings that mixed straw and burlap together with oils. In the case of Capri by Night, Kippenberger and Oehlen were able then to deliver their stinging rebuke of the deadly solemn tone of post-war German art. Artwork description & Analysis: In this self-portrait we see a half-naked Kippenberger slumped in an enormous pair of white underpants, his face obscured by a blue balloon. The artist is once more depicted in unflattering details: a swollen beer belly, rolls of fat, a thick neck and drooping shoulders suggesting a mood of dejected resignation. This painting is one of a cycle of seven self-portraits produced by Kippenberger between the late 1980s and early 1990s. They are often referred to colloquially as the Picasso Paintings or the Underwear Paintings; the huge white underpants he wears match those worn by an elderly Picasso in a series of famous photographic portraits. While the artist made self-portraits throughout his career (Dialogue with the Youth of Today for instance) these were amongst the most honest and unflattering. Here Kippenberger, aged just 35, captures his prematurely aged body which has started to show the effects of his excessive lifestyle; the floating balloon that covers his face might suggest a feeling of shame and self-loathing. Like a number of artists before him, including Picasso, Warhol and Beuys, Kippenberger saw his persona as an integral part of his art. But where his predecessors were invested in creating and sustaining their own mythologies, Kippenberger - who was apt to remind his public that "every artist is a human being" - maintained a persona that was deeply introspective and self-critical. It was unusual for a male artist to dismantle his aura in this way. But he has influenced many artists since, particularly women such as Jenny Saville and Maria Lassnig who are interested in exploring honest ways of representing the female figure in art. Artwork description & Analysis: This somewhat delicate pencil drawing depicts a man in a workman's vest hammering two screws into his nose. Under the man's raised right hand a caption reads "do it yourself", perhaps indicating the self-destructive nature of a nomadic creative life. In the top right is a logo that reads Parkhotel, Liepzigerhof Restaurant, Innsbruck, thus confirming that the drawing was made on hotel paper (in Austria). Having spent many weeks lodging in hotels around the world, Kippenberger's drawing is one of hundreds made throughout his career on collected samples of hotel paper. In this series Kippenberger was influenced by Joseph Beuys's drawing series To Mikis Theodorakis (1982), also made on hotel paper. Like Beuys, Kippenberger made art on a range of surfaces, and hotel paper was a legitimate found source on which to impress new ideas. Though Kippenberger had parodied Beuys in the past (in Capri at Night for example) the artists shared an interest in the processes of recycling and renewal. The drawings are often sketchy and contain elements of writing, making them closer to diary entries than autonomous artworks. Together image and text reveal Kippenberger's fleeting thoughts and ideas, providing the purest record, perhaps, of where his life and art become most closely abutted. Artwork description & Analysis: This artwork is a complex installation where objects including tables, chairs and freestanding sculptures have been placed on a green ground, suggestive of grass. Chairs have been arranged to face one another, as if several job interviews are about to take place. As Kippenberger's most ambitiously scaled installation, the work was made towards the end of his career. Kippenberger took as a starting point Franz Kafka's unfinished novel Amerika (written between 1911 and 1914 and published posthumously in 1927). The books protagonist, Karl, is sent to the Amerika - the "promised land" of opportunity - in search of redemption following a sexual transgression. Karl experiences a series of bizarre adventures and comical encounters in Kafka's fantastical land (the author never visited America). Though Karl's likely fate is contested by Kafka scholars, Kippenberger installation offered an upbeat ending: "a circus in town, looking to employ reliable hands, helpers, doers, self-confident handlers and the like. Outside the circus tent there would be tables and chairs set up for job interviews." With the artwork he hoped to create the feeling of a friendly, communal space filled with employment opportunities but, as with many of Kippenberger's artworks, the installation is layered with references to work by other artists. Many of the furniture pieces are classics by designers including Arne Jacobsen and Charles Eames, while the freestanding elements are sculptures by Kippenberger and a number of his artist friends. These have been interspersed with thrift store finds, thereby levelling the field between artworks and commercially produced objects and thus continuing Kippenberger's dedicated art/life project. 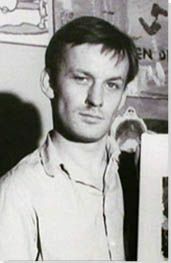 As a teenager Kippenberger spent time living in several different creative communes and this collaborative spirit stayed with him as his career developed. This artwork celebrates one of the central tenets in Kippenberger's worldview - an emphasis on community, conversation and the potency of working collectively.